Printer/Christopher why are you arguing with yourself? The club decided that a change was required if the £40m investment they had made was to be protected. 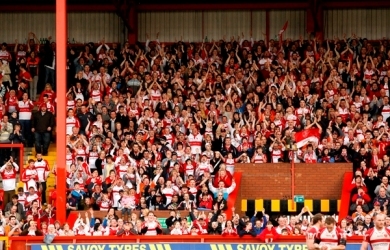 They needed to sell corporate packages and a lot of them >450 in the new North stand alone as well as all the boxes. Something needed to change - it hasn't worked out as we all would have hoped but it wasn't McDermott's decision - let's face it the general standard of play under his coaching has been dull and desire for corporate clients to pay a premium for 2019 simply wasn't there - something had to be done. We won’t beat Salford so we’ll have to win the other three. Which we could do but probably make hard work of and Toronto last game with our defence could be dicey. Had a little snigger at that one myself. Is there any real chance Leeds could contest MPG? Wins against Widnes (a) Halifax (a) and Toronto (h) would be enough and is doable despite our struggles. Have Salford at home but don’t fancy us to win that. We haven’t played well at Widnes for god knows how long, and following today’s result the Vikings will be desperate. I don’t see that as an easy win at all. Everyone’s desperate in the Middle 8’s. I don’t think it’ll be easy either but it is winnable. We lost by 2 today to a team that is much better than Widnes. Denis Betts for all the criticism he got at Widnes always could pull out a result at home and did against us a few times (a few fortunate timings pre & post World Club Challenge matches) the current Widnes team is in even worst shape than Leeds at the moment.